Located approximately 18km inland from the Costa del Sol east of Malaga, and virtually adjacent to Lake Viñuela, the small village of Viñuela lies in the attractive area known as Axarquía. The lake, known as Embalse de la Viñuela in spanish, is approximately 4Km long and has a number of picnic or bar-b-q sites around it. It is possible to swim or take part in non-motorised water sports in the lake. Although not particularly old, the village is attractive, and has a small selection of bars, shops, and a bank. Viñuela became famous in the 18th century for the sweet wine produced from the local grapes (still produced today), which gave the village it's name. 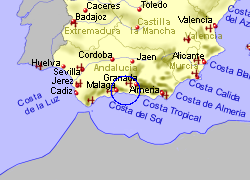 Map of the Vinuela area.